Israel Hayom title: "Will Trump divide Jerusalem in 3?" Plus, small differences in the text. This article was written and published before early elections were called in Israel. – The idea is also wildly dangerous: imagine placing one of the world's most sensitive locations under the control of the U.N. General Assembly or the Quartet on the Middle East. Its inevitable mischief could well set off the next round of fighting. – The Trump plan wrestles away sovereign areas of Israel and hands them to the Palestinians. – Doing so rewards the Palestinians despite their fulfilling basically none of their prior commitments dating back to the Oslo Accords of 1993. In other words, it encourages further Palestinian bad behavior. – Of course, making eastern Jerusalem into "the capital of Palestine" implies the U.S. government recognizes the state of "Palestine." Trump's remarks over the past year likely imply he will demand the Government of Israel recognize it too, setting off a huge debate in Israel. 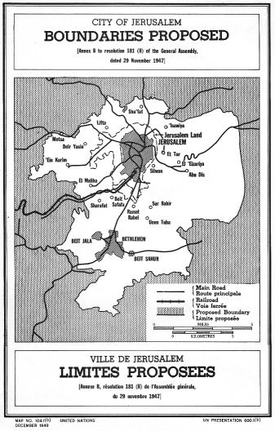 – Presumably, that "Palestine" will include parts of Jerusalem, most of the West Bank, and all of Gaza. Where the borders should run in the first two areas will drive one massive argument. A second will follow when the Palestinians inevitably decide, actually, that "Palestine" includes all of Israel too. – As Caspit points out, a proposal to divide Jerusalem into three will roil Israeli politics and harm Netanyahu, who no longer can satisfy both his nationalist base and the U.S. president. – As in other cases where Donald Trump follows his instincts against the Republican consensus (imposing tariffs, pulling troops from Syria), the left-wing of the Democratic party will (very faintly) applaud. This time, so will the European Union. – In contrast, many of Trump's Israeli and Zionist admirers, including Evangelicals, will be rudely shocked by his proposal and lash out. Given prior patterns (again, tariffs and Syria), one can confidently predict what happens next: Trump responds angrily and doubles down, vaporizing the U.S.-Israel honeymoon of the past two years. Trump supporters will bitterly divide over this issue, further weakening the conservative movement and diminishing Trump's chances at re-election. 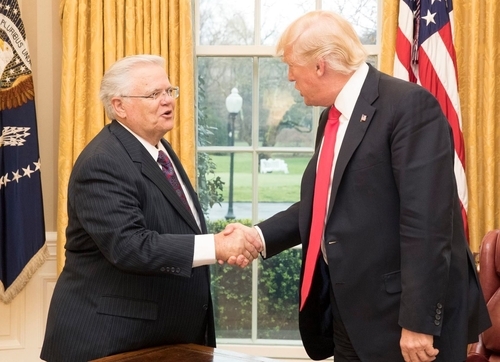 Led by Pastor John Hagee (above, meeting Pres. Trump), Christians United for Israel has over 5 million members. They will not be pleased with Jerusalem divided three ways. In brief, if Caspit is correct about Trump proposing to divide Jerusalem into three, the consequences will be major and long lasting. Dec. 24, 2018 addendum: The unexpected decision in Israel to hold elections in April probably means the Trump plan will be delayed by months – or more. This may not be an accident; as Michael Wilner writes in the Jerusalem Post, "the administration's desire to get on with its peace process may have factored in to [Netanyahu's] call for elections seven months earlier than necessary."